DESCRIPTION: A crawling shrub up to 4 feet tall, with dark green serrated leaves and bright yellow flowers that hang inverted to the stem. Compared with other native members (ko'oko'olau) of the same genus, this species has the largest flowers, up to 3 inches in diameter. Flowers from different species might only be a half-inch to 1 inch across. Because of its large blossoms, this species of Bidens is pollinated by native birds, whereas others with smaller flowers are pollinated by insects or the wind. Distribution: This plant is only found in mesic forests of Kauai. Landscape use and care: This plant does well in partial shade but will also do OK in full sun. Well-drained soil with organic amendments is also recommended. Daily watering is fine, but a good soaking every couple of days is better. This plant is not easy to find, so if you come across one, plant it in a place where you can easily show off those spectacular flowers. 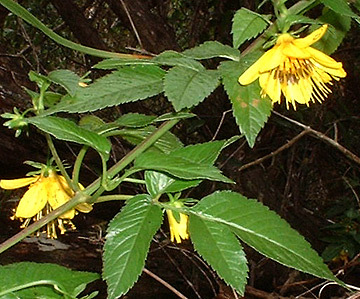 Other uses: Like other species of Bidens, the leaves and flowers of po'ola nui can be made into a tea. Pick fresh leaves and flowers, wash and brew. Gather enough to cover the surface of the water in whatever pot you use, then steep to desired darkness. Tasty tidbit: Many of us are familiar with the weed called Spanish needle or beggar's tick (Bidens pilosa). It's the one with the little dark-brown seeds and the two barbs at the end that get stuck in our shoes, socks, pants, everything. Those barbs act as the plant's dispersal mechanism, helping its seeds attach to large grazing mammals, such as cows or deer, which carry them to different places. Such mammals were not part of Hawaii's natural landscape, so in order to disperse seeds, the plants had to adapt. Instead of becoming barbed seeds, the Hawaiian Bidens' seeds became twisted, curved or more flattened out, all of which are better for wind dispersal.